Every time I drink from it, I get a little thrill—I feel just that much more sophisticated and elegant sipping from the delicate cup. It made me question why I would feel this way, until I recalled that my associating this Wedgwood teacup with virtues of refinement, elegance, and sophistication was centuries in the making. What began as a Chinese luxury import, tea changed the fabric of English society. Specifically, during the 18th and 19th century in England, drinking tea became a middle-class practice that could elevate your social status, making you seem polite, respectable, beautiful, and modern. The Chinese drank tea for centuries before it was exported to England as a luxury commodity beginning in the 17th century. Once tea was cultivated in English-controlled India, it became affordable, and a distinctive tea culture flourished among all levels of society. English lore credits the invention of “afternoon tea” to the Duchess of Bedford (1783-1857) who took her tea at 5 in the afternoon with bread, butter, and cakes. The epitome of afternoon tea’s material culture was the matching tea service. 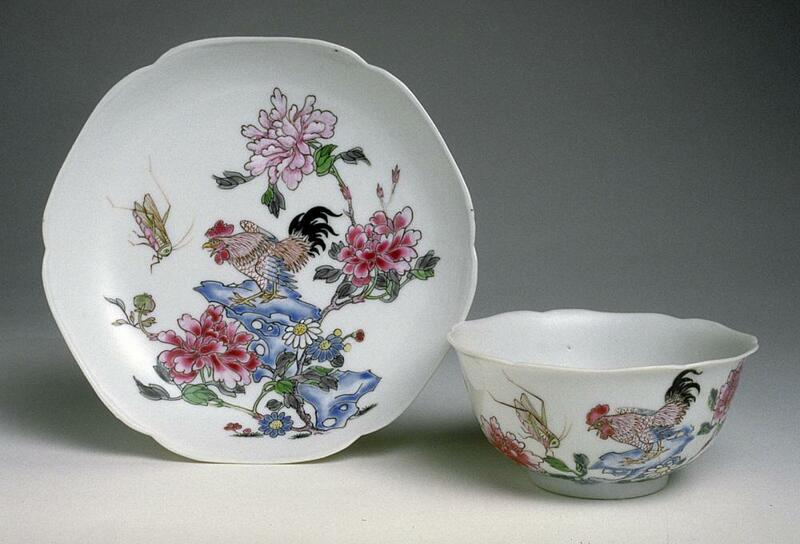 Since it was tailored for a population keen on drinking tea with milk and sugar, a tea service included additional types of wares such as creamers and sugar bowls that have no Chinese counterparts. Afternoon tea culture appealed particularly to the rising middle class because it came with its own set of material goods, forms of etiquette, and a body of cultural meaning that helped to distinguish them in an increasingly modern world. A phenomenon for the middle class developed during the 18th century whereby taking tea in one’s home became a form of social entertainment. In other words, the once-private domestic sphere became public, and the home now considered as the site where virtues such as politeness and respectability could be found. The painting above of “The Strode Family” (c. 1738) by William Hogarth exemplifies this phenomenon. It presents a family entertaining a guest with tea in their home. The act of drinking tea is contextualized with other markers of refinement—fashionably-dressed people, an elegant interior, and landscape paintings on the wall that relate to the family’s travels—to suggest its virtue by association. Hogarth’s painting is a “conversation piece,” so called because it depicts demonstrations of respectability through particular kinds of social rituals: engaging in conversation, reading poetry, playing card games, and drinking tea. With English tea culture established within this context of respectability and domesticity, it became a natural area of concern for the Aesthetic Movement that occupied the avant-garde later during the 19th century. Among its other attributes, the Victorian era (1837-1901) was a period of increasing urbanization and industrialization. Certain artists of this age perceived an “ugliness and vulgar materialism” to these phenomena and desired a reform in the arts, as well as in all aspects of life, through the pursuit of beauty. This reform came to be called the Aesthetic Movement, and its purview ultimately extended into the middle class home and lifestyle. The painting above by James McNeill Whistler introduces a key concept of the Aesthetic Movement and its application to the domestic sphere. In the painting, Whistler created a so-called aesthetic environment whereby all the elements of the room—artistic objects such as furniture, accessories, decor, and even clothing—relate in harmonious ways. Aesthetes believed that artistic objects would inject beauty into daily life and transform the middle class home. And such artistic objects even assumed moral powers capable of nourishing the spirit and elevating social behavior. The daily ritual of afternoon tea got the Aesthetic treatment and became a stage to display one’s sensibilities. One artistic object that saw keen popularity among the upper and middle classes was a new type of dress called a tea gown, as worn by the subject in Whistler’s painting. Hallmarks of this new fashion included loose, flowing lines and references to historical or foreign styles. Women wore the gowns primarily for entertaining at home during afternoon tea or informal dining. The tea gown was a perfect “artistic object” because it offered an outlet to showcase the wearer’s individuality. It also contrasted with the corset and bustle of her more formal public dress. More than just a fashion whim, the tea gown’s rise in popularity in England paralleled major changes involving dress reform and women’s health, and ideals of modernity. Dresses such as the tea gown were promoted by both the Aesthetes and dress-reformers alike. For the Aesthetes, adopting an artistic dress would improve women’s health and that in turn would bring about their natural beauty. Other reformers touted artistic dress as not only healthy, but practical for the modern woman in her new roles in work and play. Tea gowns allowed for an ease of movement that encouraged health and beauty and an active lifestyle that were characteristic of these ideals of modernity. — Patricia A. Cunningham, "Reforming Women's Fashion, 1850-1920: Politics, Health, and Art"
The story of afternoon tea culture in England describes an amazing phenomenon that occurred in several other cultures to where Chinese tea was exported. Tea was essentially a foreign product, but became so popular in England that it was acculturated into an English practice distinctive from its Chinese origin. In short, wear a tea gown and drink tea in 19th-century England, and you would be regarded as polite, respectable, beautiful, healthy, and modern. Portions of this post first appeared in Lotus Leaves. What are today’s status markers? Would drinking Peet’s Coffee or Blue Bottle Coffee be analogous to drinking tea in the 19th century?